ENERGY STAR is a good tool to help narrow down your options so you can select the window glass package that best fits your needs. As you might expect, different combinations of window features are more beneficial in different climates. 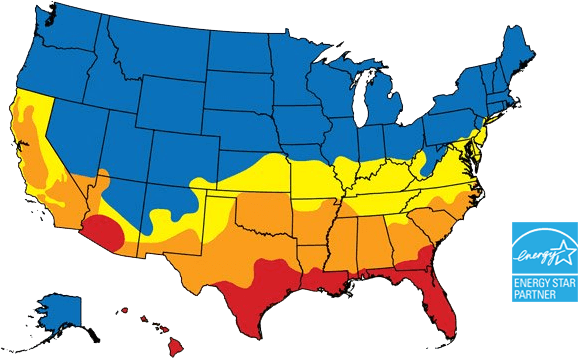 In the US, four climate zones have been identified based on the amount of sun, heat and cold they receive throughout the year. In general, the further North you live, insulation value (U-Factor) is more important. As you move South, reflecting heat from the sun (SHGC) becomes more important. Air Leakage ≤ 0.3 *ENERGY STAR 2015 Criteria for the Northern Zone: U-Factor ≤ .30, SHGC = Any Criteria for all other zones are the same for 2015. With the ENERGY STAR Most Efficient designation, products are recognized as the latest in technology innovation for cutting-edge performance. Latitude Glass options that meet these stringent criteria are available for all zones and offer different levels of view clarity. If you desire the best performance, choose windows that meet ENERGY STAR Most Efficient criteria. Select your region below, and choose the glass option that best fits your needs. Your Sunrise dealer can make a recommendation to you for what is best for your area.